To understand the nature of Realm of Illusion, we need to go back to 1996 and the Mirage set. Buried deep within the set was a humble, unassuming Black Spirit creature, one that offered a strong value in the day as a two-mana, 2/1 flier. To balance the card, though, Wizards had to offset this with a drawback, and so the Skulking Ghost was made into a fragile, brittle thing. Simply by being the focus of magical attention, the Ghost would disappear. This “mechanic” of sorts then darted in and out of successive Magic releases, making the odd appearance here and there as befitting the name of its progenitor. Visions had the Tar Pit Warrior. Mercadian Masques paid overt homage with the Skulking Fugitive. It conditionally appeared on cards like Cursed Monstrosity and Boneshard Slasher, then revived (as so many things were) in Time Spiral as the Skulking Knight, sticking the mechanic on a generic flank-Knight body but giving it an extra point of power and toughness to compensate for the disadvantage. When Magic 2010 was in design, R&D decided that the ability was more suitably Blue rather than Black, as a means of giving Illusions some depth. 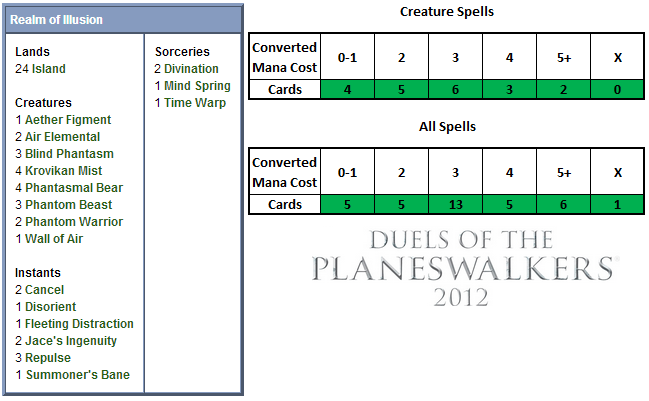 Thus the Illusionary Servant was born, and Magic 2011 was next with the Phantom Beast. It wasn’t until Magic 2012, however, that the ‘tribe’ really took off, with the Phantasmal Bear at common, Phantasmal Dragon at uncommon, and Phantasmal Image at rare. The deck leads off aggressively with a full playset of Phantasmal Bears. This is both an acknowledgement of the Bears’ strength, as well as an admittion that there’s not a lot on offer for this earliest of drop slots. A 2/2 is a fine creature to stick the Illusion ‘drawback’ onto, since most anything that targets it is likely to kill it anyway. The most dangerous thing to this deck isn’t a burn or kill spell, since most of the creatures are on the smaller side anyways. Instead, it’s any creature that can repeatably target another, even for a minor effect (like a Prodigal Pyromancer). Moving up to the two-drops, we find another playset here, this time Coldsnap’s Krovikan Mist. At the very worst a 1/1 flier, this is a solid performer in the deck thanks to its quasi-tribal nature. It won’t be unusual to see this come out as a 3/3- a steal for two manam annd one without the Illusion’s “skulking” vulnerability to boot. You also have an Aether Figment here, an uncommon from Zendikar. This is a poor deal at two mana, looking much better at five when the kicker is paid. You won’t always have the luxury of setting your own schedule, but you’ll want to get the most out of this card as often as possible. Transitioning into the midgame, we find more emphasis on smaller, evasive bodies in a pair of Phantom Warriors. Long a staple of Blue decks, the Warrior like the Figment can slip right past a defender’s lines for damage. It’s a bit small for three mana, though, so there’s also a trio of Blind Phantasms. These Illusions, looking stately in their Future Sight card frames, lack the evasion of the Warrior but carry an extra point of toughness. That gives them some durability, and you some reasonable prospect of defense as you look to set up your board state. Towards that end, there’s also a miser’s copy of the Wall of Air, a staple card from the game’s very beginnings. A trio of Phantom Beasts comprise the entirety of your four-drops. Like the Bears, these offer you more for your mana as they carry the target/sacrifice drawback. Unlike the Bears, though, their impressive 4/5 size makes them a magnet for even the weakest of targeted removal spells. These will be somewhat difficult to keep around, but will do a job for you if you catch your opponent flat-footed. Finally, there’s a pair of Air Elementals at the top of the mana curve. These serve as your closing options, the game-ending reward for having set up your defenses and carved off a steady stream of life with your evasive bodies. To help you find your answers and burn through your deck, there’s no small amount of card draw on offer here in the noncreature supporting suite. A pair of Divinations are de rigeur for any Blue precon deck worth its salt, giving you two cards for three mana. For an extra card- at instant speed, no less- you get a pair of Jace’s Ingenuities as well. Finally, a Mind Spring from Morningtide/Magic 2010 gives you a way to refill your hand later in the game, when mana is far less dear than cards. In the meantime, you’ll have the option to lay down a minor suite of permission, thanos to a pair of Cancels and a Summoner’s Bane. The Bane is a bit unwieldly, but the fact that it gives you an Illusion creature token synergises nicely with the Mists. For creature control, your options are a bit limited if you don’t manage to counter them outright. A trio of Repulses will bounce a creature back to hand to let you try a second time, or save one of your own from death (though not your skulk-minded Illusions, mind). These also let you draw a card, reinforcing the card-draw subtheme. From there we also have a couple of combat tricks in a Disorient and Fleeting Distraction, with the latter again offering a card to replace itself in your hand. Finally, Mind Control lets you simply steal your opponent’s best threat outright, not only putting them down a creature, but putting you up one. Not a bad deal for the five mana it costs to play! Rounding out the package is a pair of one-off effects in Time Warp and Evacuation. 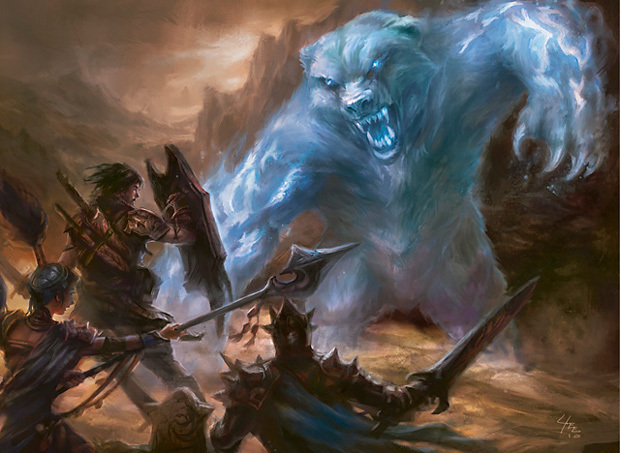 The Warp was originally printed in Tempest (with a wink and nod to fans of The Rocky Horror Picture Show in its flavour text), but made a comeback as a mythic rare in Magic 2010. It’s a sorcery with a very simple- but very powerful- effect, the granting of an extra turn. Evacuation, on the other hand, has a not-dissimilar effect. Although on the surface it seems quite different, returning every creature to hand also has the effect of buying you the gift of a little extra time. It’s best used with a lot of enters-the-battlefield effect creatures, of which this deck has none, but it can still give you another chance to counter a creature that was giving you fits in play. Overall this is an interesting take on Blue, and an exciting departure from what’s come before. We’ll put it through its paces and come back in two days’ time with the result. See you then!